On Saturday (May 5), Gucci hosted a private event to celebrate Gucci Wooster, its first ever presence in SoHo, New York. The celebration saw many stylish attendees bring out bold looks for the occasion. Rihanna: The singer never falls to come up with inventive combinations and this was no exception. She used the opportunity to showcase a top and bra from her Savage x Fenty lingerie line by styling it with Gucci Fall 2018. There are a multitude of references but the cool mash-up is unmistakably her. 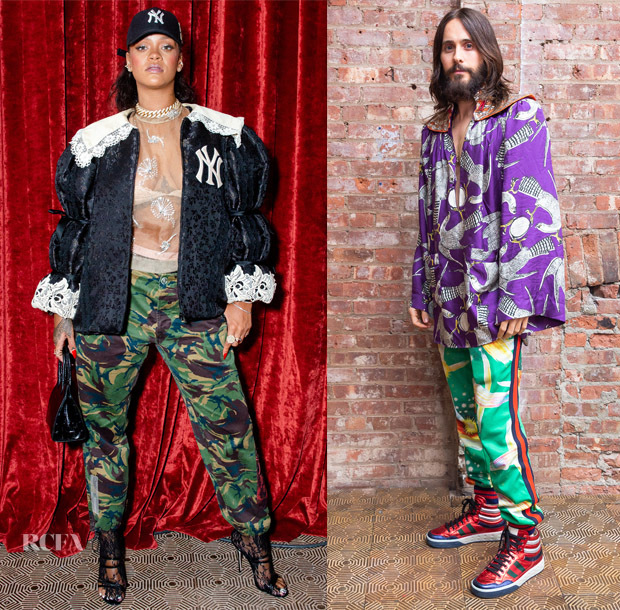 Jared Leto: As a lover of head-turning looks and as someone who has openly embraced Gucci’s more-is-more aesthetic, he showed his fashion-forward credentials in Fall 2018. It’s loud, colourful, zany and you cannot help but grin when you see it. A$AP Rocky: Another one who loves to experiment with fashion, his layered Fall 2018 carried a preppy feel. The standout piece is the bag which I can see being a divisive style given its oversized shape. Alexa Chung: The fashion designer succeeded in remaining true to her personal style while embracing the brand’s whimsical nature in Gucci Pre-Fall 2018. It’s a playful take on suiting. The accessories help personalize it. Salma Hayek Pinault: Given some of the high impact looks, I was surprised to see she went for a more understated look — an embellished biker jacket is subdued in comparison to the kaleidoscope of prints and patterns. It was trendy and put-together, but I was expecting more. Who Was Your Best Dressed On Day 1 Of Cannes Film Festival?